Maia is a tall and slender 11-year old girl who keeps everyone around her on their toes at all times. Maia’s seizures started at the maternity hospital, even though they were not officially diagnosed until when she was about 3 months old after tenacious doctor and hospital visits with mum and dad, and several attempts of different testing, including EEGs and MRIs. She was originally diagnosed with epilepsy in infancy and given the prognosis of growing out of her seizures by toddlerhood. However, the neurologist kept looking for the reason for her seizures and developmental delay, and when she was 4 years of age we finally received the diagnosis of CDKL5 (heterozygous for the mutation c.163_166delGAAA in exon 5). The neurologist had sent off blood samples to the laboratory in Cardiff, and by chance they came back positive. We received the diagnosis by a phonecall from our neurology nurse, with very little information about the condition, except the suggestion to visit the IFCR website. Later on both of us parents were tested too, but we were found not to be carriers. Maia’s seizures were got under control for 14 months, at the age of 3 months, with monotherapy of Sodium Valproate. She did really well developing and growing during that year and a bit. But when the seizures returned, there has subsequently been no more seizure freedom. Throughout the years we have tried and tested a dozen different AEDs. Currently she averages between 5 – 9 tonic seizures per week, with intermittent absences that we find difficult to keep count of. Her tonic seizures come 99% of the time when she is asleep. She is on Zonisimide and Clobazam as well as the VNS. The VNS was installed when she was 6 years old. A year after the implantation we were able to wean off the Sodium Valproate that she had been on for over 6 six years. 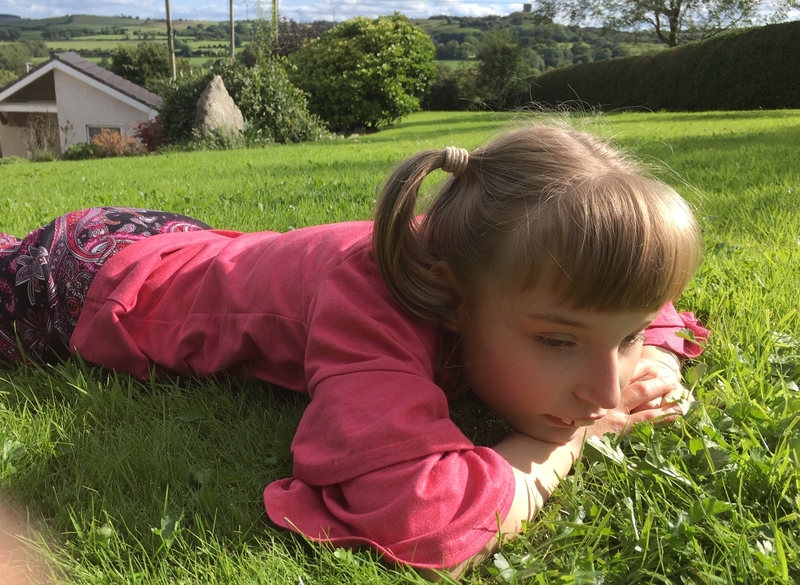 With the combination of the wean off of the Valproate and the VNS Maia became much more alert and engaging, she was starting to learn again and when turning 7 years of age, she started walking independently for the first time in her life. She has kept her walking up to this day, and while it is very wobbly and we need to be watchful of her while she is walking, it has given her a degree of independence. Maia’s gut has a very low mobility, and she gets easily constipated. She is treated with daily laxatives. She also has a rectal prolapse, which occurs 9 out 10 times when she is toileted. The consultant is not willing to operate on it due to a very high probability of the prolapse reoccuring because of the general condition. Gastrointestinal gas causes her terrible pain and discomfort and is a seizure trigger. We have not been able to find any help or relief for the gas. Maia feeds orally regular foods, but they need to be pureed of mashed consistency. We have her on a lactose free diet as we feel lactose maybe contributing to the excess gas in her bowels. She drinks independently from a sippy cup, but needs to be spoon-fed. Maia was diagnosed with precocious puberty three years ago at the age of 8. As her doctors felt she was two young to start puberty and that the hormones might affect her seizure control adversely she was started on hormone injections called Decapeptyl to halt the puberty. The injections are given every 12 weeks, and the endocrinologist predicts that the injections will be kept up until she reaches 12 years. Maia has not been officially diagnosed with CVI. It has, however, been established that she can see perfectly well, but what her brain does with the visual stimulus it receives is a bit of a mystery. Maia’s general health is good – she has not suffered from pneumonia or other severe infections. We have been lucky to avoid frequent hospital stays with her. Maia’s gross motor skills are fairly good. She can sit unaided, raise up from the floor to standing and walk independently. She started coasting along furniture during her seizure free period before the age of one. Once the seizure returned that plateaued, and she didn’t start walking again until at the age of 7. Some times she still prefers to crawl on all four. She does need supervision with all of her mobility though, as she has no perception of space or sense of safety for her self. She has a helmet for head protection when she walks about, but she is always full of bruises on her legs and knees from her tumbling. But we prefer her to have freedom of movement at home as during the day at school she is confined to a chair most of the time. When at home she paces up and down the house, and then curls into a ball every now and again for a rest. Her fine motor skills are moderate also, she is able to pick up small things with her fingers, and pick toys independently and transfer them from one hand to the other. She mouths most of her toys and often her fingers and hands also. Maia has some CDKL5 typical movements, such as clapping her hands, sitting cross-legged, mouthing objects/hands and grinding her teeth. Maia has difficulties with her sleep, in the evenings she finds it hard to shut down. We give her melatonin to help with this, but there are nights 4 – 5 times each month when she may go through the whole night without sleep. That can be hard going for mum... Maia does not have any speech, not a single word. But she gets her wants and dislikes across very firmly. She will push away with her hand or turn her head if she does not want something, or reach and crab something she does want. She can also choose between two offered options, for instance milk or juice by reaching for her choice. We have not been able to establish any method of communication with applications or picture cards, though we do use objects of reference to support speech. Maia has been receiving physio-, occupational-, speech and language and hydrotherapy along the years. Hydrotherapy is her absolute favourite, she loves being in water, whether it’s the bath, the pool or a lake. But she does tend to swallow a lot of water in the process… Her school is attached to a therapy services centre, so she receives her therapies during school time. Maia goes to a special school for children with multiple disabilities. This is her 6th year of being in the school. She likes school and enjoys going, and we notice especially during long holidays how she gets a bit bored at home. At school she gets to do all kinds of nice things with her class friends, physical education, home-economics, counting etc. She has “floor-time” twice a day to get out of her chair for 5 – 10 mins at a time. Otherwise she spends her school day in a chair of some sort, on her wheelchair in the bus to and from school, in an activity chair during the day, and in a toileting chair in the bathroom. We have the same chairs at home too. Other equipment that Maia has is a wheelchair accessible car at home, an activity chair for feeding and other activities at home, and a through the floor lift, as our house is on two levels, with bedrooms upstairs. We were given a hoist for Maia as well, but we find using it too difficult as Maia is so mobile and at home rarely in a chair unless she is being fed or toileted, or when we go out and about. Maia lives at home with mum and dad, her little “big” sister, two cats and an aquarium. Maia loves being outdoors, going for wheelchair walks or walking up the road hand in hand with dad or mum. She has a swing that she loves, and a small trampoline that she loves bouncing on. She loves feeling different textures, so outside she loves lying on the lawn feeling the grass, or playing with gravel or sand on the yard. Maia also loves the sun, she always finds the “sun spots” on the floor and seeks to go into them. Maia likes music and loves making lots of noise, she has lots of instruments that she likes to play, such as a tambourine, maracass and jingle bells, the noisier the better! This is Maia in a nutshell, with all her ailments and aches. Each day is a new day, some full of joy and some very tough and arduous, but she is a strong young lady who keeps us fit with all that goes along with her!